Editor's note: Isobel Coleman is the author of "Paradise Beneath Her Feet" and a senior fellow for U.S. foreign policy at the Council on Foreign Relations in New York. (CNN) -- Back in March, Amnesty International began reporting that the Egyptian military had subjected 17 women protesters at a Tahrir Square demonstration to "virginity tests." The women told Amnesty that they had been handcuffed and beaten, stripped searched and photographed by male soldiers, then restrained by female soldiers while a man in a white coat performed a virginity check. The military denied the accusations, but in the past few days, a senior general has confirmed to CNN that indeed, the virginity tests happened. The general justified the abuse by saying these women "were not like your daughter or mine. These were girls who had camped out in tents with male protesters." The general went on to insist that the tests were necessary because "we didn't want (the women) to say we had sexually assaulted or raped them, so we wanted to prove they weren't virgins in the first place." What are virginity tests? They are a controversial but relatively common practice in Egypt -- so much so that hymenoplasty (hymen restoration) is often sought by Egyptian brides to protect their reputation on their wedding night. But their use as an intimidation factor by security forces seems to be a new twist. And based on the outrage across Egypt over this abuse, it seems that the military's attempt to intimidate and smear the women protesters has backfired. Human rights groups are demanding a full investigation and several demonstrations are planned in coming days in support of the women. Egyptian security forces have a long and troubling history of abusing and torturing citizens for political ends. They have engaged in widespread intimidation tactics since the upsurge in political violence and Islamic militancy in the early 1990s, including the detention of women, children, and the elderly. In the last two decades, the practice of arrest and detention without trial has expanded to anyone considered a threat to the military or the former regime of Hosni Mubarak, especially those advocating political reform. Women suffer special mistreatment. For example, Esraa Abdel Fattah -- better known as the "Facebook Girl" who in 2008 mobilized thousands of young people to march for political change -- was arrested for her leadership role in those protests. Egypt's security forces tried to destroy her reputation by accusing her of being a prostitute, but her Facebook compatriots saw through that ploy and several young men even proposed marriage to her while she was detained. More broadly, Egyptian women were abused and discriminated against both before and after the 2011 revolution. And although they played an important role in toppling Mubarak, it is not at all clear that their situation will improve under whatever system emerges. The military council that is ruling the country ahead of elections entirely excluded women from the constitutional committee that determined the new political process. There are rumblings that the constitutional quota holding seats for women in the lower house of parliament might be eliminated. The quota must be maintained as a means of ensuring women's participation in politics. At street level, the treatment is similar. Women in Egypt are violated physically and abused verbally on a regular basis. According to Human Rights Watch, the women who marched in Tahrir on International Women's Day in March were told by a crowd of male attackers: "You are not Egyptians ... better for you to go home and feed your babies." Equally troubling was that the soldiers who broke up the mob asked why the women were demonstrating now, telling them this was "not the right time" and they were "wrong for coming out to demonstrate." Later, a throng of men harassed, groped and chased a group of several hundred women who'd gathered. Such scenes reflect that respect for women's rights, far from being a sideline issue either before or after the revolution, is in fact an important test of the revolution's success or failure. Thanks largely to the actions of the military, 2011 may become a revolution of liberty but not of equality. The charges against the military come at a difficult time: As they gear up for elections, military leaders are attempting the Sisyphean task of trying to distance themselves from the abuses of the Mubarak regime. Virginity testing is something that conservative judges in Iran, or Mujahedeen leaders in Afghanistan, impose on women. The Afghan warlord Ismail Khan, when he was governor of Herat after the fall of the Taliban, was notorious for taking women off the streets who were seen walking with men and subjecting them to virginity tests. Such behavior is hardly a good image-builder for the Egyptian military, which wants to position itself as a professional, modern caretaker of the state. It is also not an encouraging sign for women's role in Egypt's new society. Since the heady first days of the peaceful protests, when uncovered women wearing jeans and smoking cigarettes broke bread with conservative Islamists, there has been a marked deterioration in tolerance and inclusion. 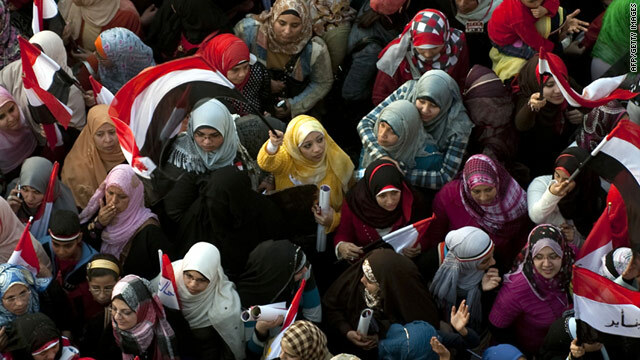 The violence that marred International Women's Day in Tahrir Square, was an unfortunate harbinger of greater tensions, sectarian divisions and brutality that have infused even Egypt's revolution. Reform will have a better chance of success if Egyptians can sustain a peaceful and inclusive transition. Holding the military accountable for its brutal and demeaning tactics is an important step in that process. The opinions expressed in this commentary are solely those of Isobel Coleman.